uuid : 6d766529-ee84-491a-9da9-74c923900772 templates_id: 119482 templates_uuid: "72fac5a2-e6f3-48cf-b2cb-ea5fd9391fb6" title: "Terms and Conditions for the Supply of Services to Consumers - B2C" display_name: "Terms and conditions for supply of services to consumers" meta_keywords: "T&Cs for supply of services" description: "
Protect your business with clear and fair terms and conditions for the supply of services (or goods and services) to consumers. Use these business-to-consumer (B2C) terms and conditions for any business in England & Wales that supplies services (or goods and services) to consumers. They are designed to be straightforward and comprehensive so that customers know where they stand and needless disputes can be avoided. They cover key issues such as orders, supply, customer responsibilities, pricing, payment, guarantees, liability, cancellation and termination and data protection. You do not need to use these terms and conditions if you offer services on a daily basis which are performed immediately (eg hairdressing), or if the services are supplied under an employment or apprentice contract. What are terms and conditions for the supply of services to consumers? Terms and conditions for the supply of services to consumers (also known as T&Cs) should be used if you want to supply services to consumers on standard terms. They should cover key issues such as orders, supply, customer responsibilities, pricing, payment, guarantees, liability, cancellation and termination. Why do I need terms and conditions for the supply of services to consumers? Terms and conditions for the supply of services to consumers protect your business interests, ensure that customers know where they stand and help avoid disputes. T&Cs should appear on the back of all contractual documents, including quotations, order forms, acknowledgements of orders, delivery notes or in a brochure or catalogue. They should be available to a customer before or at the time a contract is made. This helps to ensure they are binding. You should consider whether the services involve the provision of any related goods or materials (eg fitted kitchens and bathrooms). Whilst many service agreements involve pure services, many involve the provision of ancillary goods. If ancillary goods are being provided, you will need to include a provision for this in the terms and conditions. If the service being provided doesn\302\222t satisfy the above rights, you may have to repeat the entire service at no extra cost to the consumer. Where repeat performance of the service is impracticable the consumer may be entitled to a refund or price reduction which could be up to 100% of the cost. The trader should refund the consumer within 14 days of agreeing to a refund. There is no legal requirement to provide a guarantee for the services, however you may wish to offer one as part of your customer service. You may wish to provide a guarantee for the ancillary goods if you are in a position to replace or repair them. You can state in the T&Cs the time period for which payment is required for the service. However the time period between payment and performance of the service can\302\222t be too far apart (eg 1 year in advance of the service). What are the termination rights of consumers? Consumers have a statutory right of 14 days from entering into a service contract to cancel it. If the provision of services include ancillary goods then the 14 day termination period starts from when the last batch of goods has been received by the consumer.
" created_timestamp: "2018-10-08 04:36:16.0" modified_timestamp: "2018-10-08 04:36:16.0" active: true created_by: 236 modified_by: 236 dcm_id: 326 url_slug: "Terms-and-conditions-for-supply-of-services-to-consumers" meta_description: "Create terms and conditions for supply of services to consumers with help from Rocket Lawyer. Protect your business when you supply goods and services to consumers with these B2C terms and conditions. Try this terms and conditions template." If the service being provided doesnt satisfy the above rights, you may have to repeat the entire service at no extra cost to the consumer. Where repeat performance of the service is impracticable the consumer may be entitled to a refund or price reduction which could be up to 100% of the cost. The trader should refund the consumer within 14 days of agreeing to a refund. You can state in the T&Cs the time period for which payment is required for the service. However the time period between payment and performance of the service cant be too far apart (eg 1 year in advance of the service). More than just a Terms and conditions for supply of services to consumers template, our step-by-step interview and guidance makes it easy to create your document. Easily create online, download, print and sign your free Terms and conditions for supply of services to consumers in minutes. 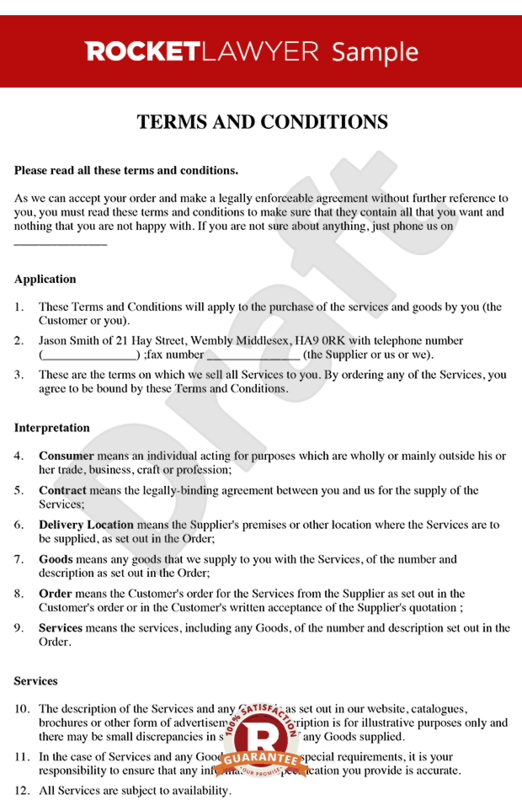 This document is also sometimes called: T&Cs for supply of services.